Congenital conditions that cause airway obstruction (eg, laryngomalacia, subglottic stenosis, vascular rings, and subglottic cysts) may be present at birth but may not initially manifest as stridor, resulting in delayed presentation. Children should be kept calm to prevent turbulent airflow and the precipitation of airway compromise; therefore, unnecessary procedures should be avoided. While croup should be diagnosed clinically and does not require an x-ray for diagnosis, a soft-tissue neck x-ray may be obtained to help assess for other possible diagnoses (eg, epiglottitis, neck mass, retropharyngeal abscess, or foreign body). 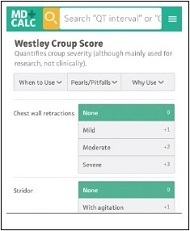 The Westley Croup Score quantifies croup severity and is used to assess response to treatment, especially in clinical research. The original score (Westley et al 1978) was derived to objectively measure a clinical state, in order to allow comparisons over time in response to treatment. It was developed to compare the response of nebulized racemic epinephrine versus saline, not to derive a prognostic scoring system. The range of values for each of the 5 clinical signs was arbitrary and each item was weighted based on the clinical implications of the most critical form of the sign. A follow-up study demonstrated construct validity (Klassen 1999), with multiple studies showing high interrater reliability (Klassen 1999; Super et al 1989). The Westley Croup Score is the most commonly used scoring system for croup. It was originally designed to measure severity in research settings, but in clinical practice it is often applied to prognostication. The score may be useful in determining treatment efficacy and patient disposition. It has fair interrater reliability among clinical users, although interrater reliability is better in research studies. A change in the score correlates well with patient disposition and global assessment, as rated by both parents and by emergency department physicians. The score continues to be used in studies for treatment of croup because of its demonstrated validity and reliability among users. Croup is a clinical diagnosis based on the patient’s history and the physical examination. Consider croup (laryngotracheobronchitis) in patients aged 6 months to 6 years with acute onset of stridor, barking cough, hoarseness, and respiratory distress, sometimes concurrent with symptoms of upper respiratory infection. The Westley Croup Score can be used to quantify the severity of croup. It is traditionally used for clinical research purposes to track patient response to treatment over time; it is not used clinically to guide therapy. Researchers have attempted to separate viral croup from “spasmodic” (ie, recurrent, short-lived) croup, which may be due to allergic reaction or viral antigens. This score is traditionally used for clinical research purposes to track patient response to treatment over time. The score also has been used with moderate reliability to assess for postextubation upper airway obstruction. Severity classifications are correlated with Westley Croup Scores. A 2011 Cochrane Review showed that glucocorticoids improved the Westley Croup score at 6 and 12 hours, prevented repeat visits, and decreased length of stay (Russell et al 2011). The optimal glucocorticoid dose has not been determined; conventionally, the dose used is 0.6 mg/kg of dexamethasone, ad-ministered intravenously or orally (Russell et al 2011). A study in Thailand compared the effectiveness of 0.15 mg/kg and 0.6 mg/kg glucocorticoid doses. The study found no difference in the mean Westley Croup Scores of the groups that received each dose; however, this was a small study (n = 41) and patients also received racemic epinephrine nebulization prior to steroid administration (Chub-Uppakarn and Sangsupawanich 2007). Definitions of croup severity are neither widely accepted nor rigorously derived. A more clinically relevant classification scheme was developed by the Alberta Medical Association Clinical Practice Guideline Working Group. Treatment algorithms differ among institutions. The Westley Croup Score was designed to track changes in the presentation of croup over time and is primarily used in research studies. Croup remains a clinical diagnosis, with the hallmark symptoms of barky cough and hoarse voice, with or without stridor. The methodology for the original and follow-up validation studies (Klassen 1999; Super et al 1989) was rigorous. Both studies were prospective double-blind, randomized, placebo-controlled trials using a stringent definition of croup, and excluded the most mild or short-lived cases through pre-enrollment standardized mist therapy for all patients. The primary outcome common to many treatment trials that used the Westley Croup Score was a positive clinical response, defined as a reduction in the score by 2 points, or return to a score of 0 or 1 point. Mild, moderate, and severe classifications and standardized treatments were studied and developed years later. In the interrater reliability analysis performed by Super et al (1989), identical scores were found in 75% of the cases, while the remaining scores differed by only 1 point, for a weighted kappa of 0.75. Interrater reliability analysis in Klassen et al (1999) demonstrated a weighted kappa of 0.95 ± 0.02 among research assistants and primary investigators. Since 1994, the score has been further validated and is the main scoring criteria used in the evaluation of a patient’s response to treatment in clinical trials. In 2011, a Cochrane Review performed a meta-analysis of studies that used glucocorticoids to treat croup. The review identified 41 trials of glucocorticoids versus placebo or any other treatment modality. The analysis showed a significant improvement in the Westley Croup Score for patients at 6 and 12 hours. The Westley Croup Score was considered a primary outcome. Secondary outcomes included length of stay and use of another treatment modality (Russell et al 2011). Read more about Dr. Klassen. Westley CR, Cotton EK, Brooks JG. Nebulized racemic epinephrine by IPPB for the treatment of croup: a double-blind study. Am J Dis Child. 1978;132(5):484-487. Super DM, Cartelli NA, Brooks LJ, et al. A prospective randomized double-blind study to evaluate the effect of dexamethasone in acute laryngotracheitis. J Pediatr. 1989;115(2):323-329. Klassen TP. Croup. A current perspective. Pediatr Clin North Am. 1999;46(6):1167-1178. Bjornson CL, Johnson DW. Croup-treatment update. Pediatr Emerg Care. 2005;21(12):863-870. Cherry JD. Clinical practice. Croup. N Engl J Med. 2008;358(4):384-391. Johnson D. Croup. BMJ Clin Evid. 2009;2009:0321. Russell KF, Liang Y, O'Gorman K, et al. 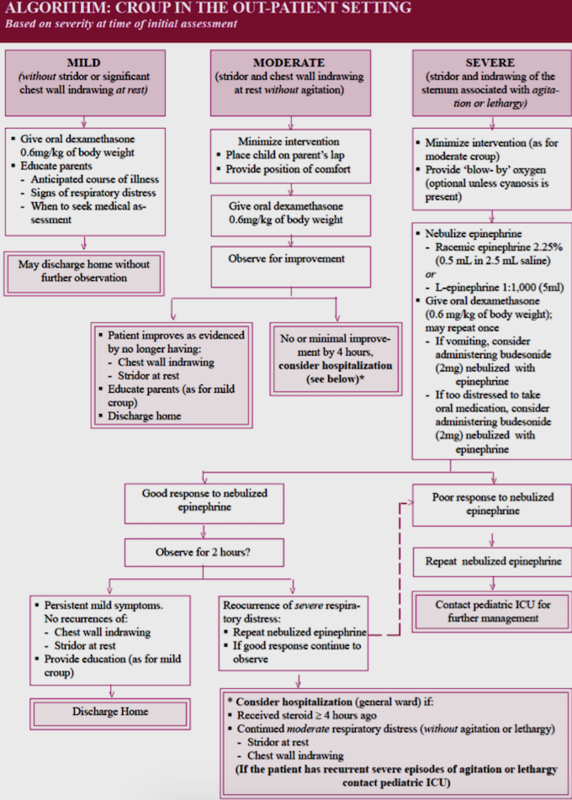 Glucocorticoids for croup. Cochrane Database Syst Rev. 2011;1:CD001955. Chub-Uppakarn S, Sangsupawanich P. A randomized comparison of dexamethasone 0.15 mg/kg versus 0.6 mg/kg for the treatment of moderate to severe croup. Int J Pediatr Otorhinolaryngol. 2007;71(3):473-477. Alberta Clinical Practice Guideline Working Group. Guideline for the diagnosis and management of croup, 2008 update. Alberta, ON, Canada: Alberta Medical Association. 2008. Identify the most common and serious etiologies that cause acute and chronic stridor. Determine necessary diagnostic testing and appropriate use of resources for children with stridor. Manage acute and chronic presentations of stridor in the emergency department. Date of Original Release: November 1, 2017. Date of most recent review: October 15, 2017. Termination date: November 1, 2020. Other Specialty CME: Included as part of the 4 credits, this CME activity is eligible for 0.5 Pharmacology CME credits, subject to your state and institutional requirements. Faculty Disclosure: It is the policy of EB Medicine to ensure objectivity, balance, independence, transparency, and scientific rigor in all CME-sponsored educational activities. All faculty participating in the planning or implementation of a sponsored activity are expected to disclose to the audience any relevant financial relationships and to assist in resolving any conflict of interest that may arise from the relationship. Presenters must also make a meaningful disclosure to the audience of their discussions of unlabeled or unapproved drugs or devices. In compliance with all ACCME Essentials, Standards, and Guidelines, all faculty for this CME activity were asked to complete a full disclosure statement. The information received is as follows: Dr. Marchese, Dr. Langhan, Dr. Bin, Dr. Toledo, Dr. Claudius, Dr. Mishler, and their related parties report no significant financial interest or other relationship with the manufacturer(s) of any commercial product(s) discussed in this educational presentation. Dr. Jagoda made the following disclosures: Consultant, Daiichi Sankyo Inc; Consultant, Pfizer Inc; Consultant, Banyan Biomarkers Inc; Consulting fees, EB Medicine.